Apr. 14–Satellites used to be the Rolls Royces of the sky, handmade with rosewood dashboards and calf leather seats. But they’re becoming the Ford Focuses — mass-produced, plastic dashboard econoboxes. And for the military and the civilian market, that’s changing everything as costs for new satellites and the rockets to launch then plummet and an emerging, hip sector of the industry takes leadership of what used to be run by guys in suits. Jeff Matthews, an industry consultant with Deloitte, says space today is where computers were in 1990, when IBM gave way to the dotcom boom. “We are seeing what helped define success on the internet play out in space,” Matthews said during a break at the Space Symposium, which drew the nation’s top space industry experts to Colorado Springs last week. The world Matthews foresees involves a lot more satellites for military and commercial purposes. The military wants more satellites to decrease risks in the event of an enemy attack in orbit. Industry is thinking about everything from satellite-based internet to sensors that can provide real-time data for businesses, picture an accurate and instant count of cars in a mall parking lot or crops ready for harvest. 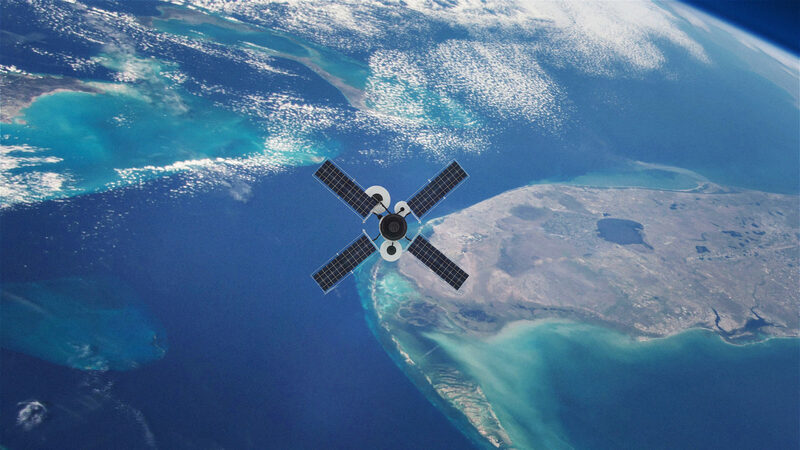 The Aerospace Corp.’s Edward Swallow said it’s the commercial applications for space and the new companies entering the fray that have changed the world of satellites, not NASA or the military. “Now the market is driving government,” he said. On Thursday, as the Space Symposium was wrapping up, that market was on full display as SpaceX launched its new Falcon Heavy Rocket to place a Saudi Arabian communications satellite in orbit. SpaceX and other firms have come up with low-cost rocket options that are driving down costs to hit orbit to unseen levels. Launching a satellite to low-orbit used to run $10,000 per pound. Prices have dropped by half in recent years and are expected to drop further, with one firm at the symposium predicting prices could hit less than $2,500 per pound soon. At the same time, satellite buyers are getting smaller spacecraft that can do the job it once took something the size of a school bus to accomplish. “Capacity per kilogram is skyrocketing,” Swallow said, not intending the pun. Companies including internet retailer Amazon.com are jumping into the new space market. Amazon is planning to launch thousands of satellites to capture the global market for internet service. It’s a change that has grabbed plenty of attention at the Pentagon, where leaders from acting Defense Secretary Patrick Shanahan to Air Force boss Heather Wilson want to field satellites faster amid a growing Cold War in orbit that pits America in a race against such rivals as Russia and China. Wilson said her agency is courting new entrants to the space business with development grants that she says can be issued more quickly than a bartender can pour a beer. The military, which has traditionally taken a decade or more to develop satellites is facing pressure from the top to change its ways. President Donald Trump has made space a key focus of his administration, calling for a new military service branch for satellite troops while pushing the Pentagon’s space budget to more than $14 billion in his 2020 plan. Wilson pointed to the president as a key factor in the military’s effort to go faster with space programs. “Our predecessors didn’t have the leadership or focus of the president of the United States,” she told The Gazette. Colorado Springs Republican U.S. Rep. Doug Lamborn said the Pikes Peak region stands to benefit from the pressure on the Pentagon. The region is already leading in the race to house U.S. Space Command, a combat headquarters that would oversee space efforts of all military branches. The region is also home to more than 240 aerospace companies longing for Pentagon contracts. But more important than who gets paid, Lamborn said, is winning the latest version of the space race. Part of the Pentagon’s plan to regain lost ground revolves around a new agency that pulls some satellite work out of traditional military channels to a new agency with a bearded leader in shirtsleeves. Fred Kennedy’s Space Development Agency is so new that he doesn’t even have business cards. But he has big plans for hundreds of missile warning satellites that he wants spying on America’s rivals by 2022. Kennedy says he can move so quickly because companies like Amazon are making big orders for small satellites which will be punched out on production lines like so many smartphones. Kennedy’s agency has just $150 million out of the Pentagon’s space budget to get started. But he’s confident in his unconventional approach, that is long on ideas and short on bureaucracy. Pointing to the growing anti-satellite capabilities of nations including China and Russia and the looming threat of nuclear-tipped hypersonic weapons, he says it’s time for a change. “We have a culture in national security space that does not respond easily to the speed of these threats,” he said. At Michigan’s 4-year-old Atlas Space Operations, which provides satellite ground services that allow users to maneuver their spacecraft over a worldwide antenna network using devices as simple as a tablet computer, founder Michael Carey says he’s gone from piles of Pentagon paperwork to a simple question. “Can you deliver this?” Carey said. The firm is using an internet-based approach to satellite control and boasts customers including the Air Force Academy, which is using its services to control the cadet-built FalconSat-6. “Atlas has directly benefited from acquisition reform recently,” Carey said. Leaders of the Space Foundation, which runs the symposium, credit this new military acquisition plan and the growing commercial interest in space with sending the trade show to new heights in 2019. The show easily topped expectations of 9,000 visitors per day over its four-day run. The five-star Broadmoor hotel broke out a food truck offering chili dogs to feed the masses. At Air Force Space Command, the money is flowing to contractors, acquisition reform is in full swing. Wilson said decisions that used to require her secretarial OK have since been pushed down to colonels, and years have been cut from project timelines. But it’s still the Air Force, and explaining the changes requires a PowerPoint slide of mind-boggling complexity. But Lt. Gen. John Thompson, who heads the Space and Missile Systems Center in Los Angeles, said the new sense of speed is real. He’s agreeing with the new thinkers who want satellites produced as quickly and cheaply as economy cars. “Let’s build satellites like we do many of our other weapons systems, on a production line,” Thompson said. But there’s a cultural shift needed for the Pentagon to speed satellite-buying that can’t be found on a production line. Gen. John Hyten, nominated last week to serve as vice chairman of the Joint Chiefs of Staff, said a key to changing the Pentagon’s culture is eliminating a bureaucratic layer of fear. The military’s space enterprise has been gripped by a fear of failure, he said, that made leaders avoid risks.